Sauternes is a spectacularly complex wine with multiple layers of honey and exotic fruits. It’s often bold and always sweet. And we’d bet it’s a wine most people have never heard of, despite a bottle of Château d’Yquem 1811 fetching $117,000 in an auction in 2016 and setting the new Guinness World Record for the most expensive bottle of white wine. Here in France, everyone knows Sauternes and it sort of became one of those wines only drunk at Christmas. It’s becoming fashionable again, though, and a glass of Sauternes can be like golden drops of heaven. Being such a complex wine, it’s not only for pairing with desserts as it is often traditionally served. And one of the best Sauternes châteaux to visit to really see how diverse the food pairings with Sauternes can be, head to Château Sigalas Rabaud. It’s the smallest of the 1855 Premier Cru Classé estates, run by an incredibly passionate foodie who is also the sixth generation at the helm of the family-run estate, and sits on a slope looking down on the Ciron River that we think is the most beautiful in all of the Sauternes appellation in the Bordeaux wine region. It’s here that a gourmet bites Sauternes pairing picnic awaits you to discover the infinite possibilities with this unique sweet wine. 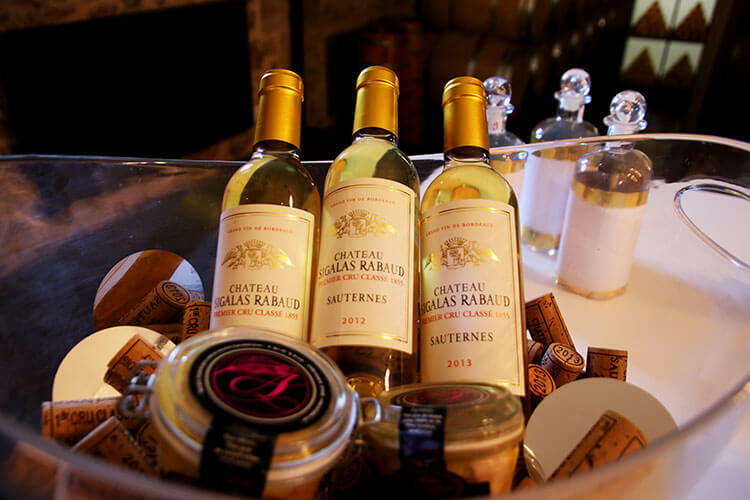 Originally just named Château Rabaud, Château Sigalas Rabaud dates back at least as far as 1660 when it was a farm. At that time it was passed to the de Cazeau family, who were magistrates in the Bordeaux parliament, as part of the dowry of Madame Peyronne de Rabaud. The château stayed in the Rabaud family for over 150 years before it was sold to Gabriel Deyme in 1819. Deyme was the owner at the time of the 1855 classification, though he sold the château less than a decade later to Henri Drouilhet de Sigalas. And it was with Henri Sigalas’ purchase in 1863 that six generations of family wine making began. 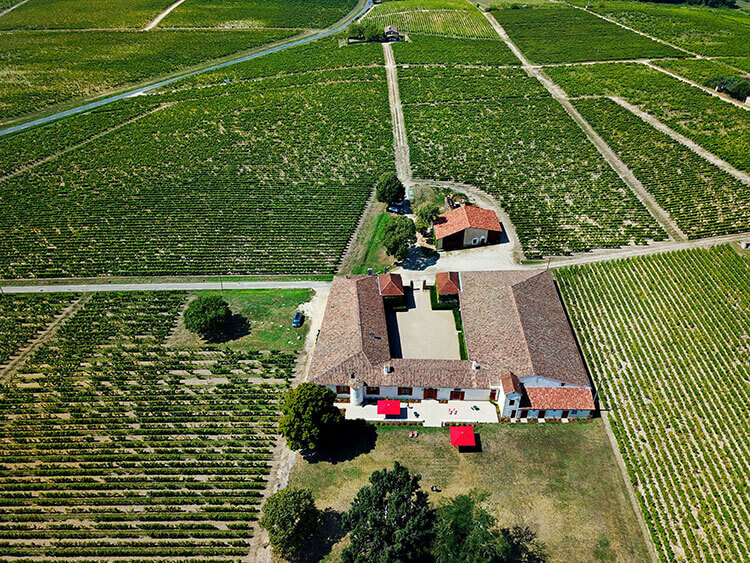 Despite being a wine estate ranked as Premier Cru Classé just as famous neighbors like Château de Rayne Vigneau and Château d’Yquem, the estate was in quite bad shape when Henri Sigalas purchased it. He devoted the rest of his life to renovating the vineyard and saw that work complete before his death. Pierre Gaston de Sigalas took over in 1895 after Henri’s death, but Pierre had never been passionate about vineyards or wine. In 1903 he sold 45 hectares of the estate, keeping only a small portion that occupied the gentle southern slope of the ‘terrasse du Sauternais’. This slope is where nearly all of the Premier Cru Classé and the best Sauternes wineries are located. It was perhaps a brilliant move to sell off the less desirable hectares to focus only on those with the coveted gravel topsoil and clay subsoil situated so close to the Ciron River. These are the 14 hectares still cultivated by the Sigalas family today. But Pierre didn’t keep up the tradition of making wine under the Château Sigalas Rabaud name. 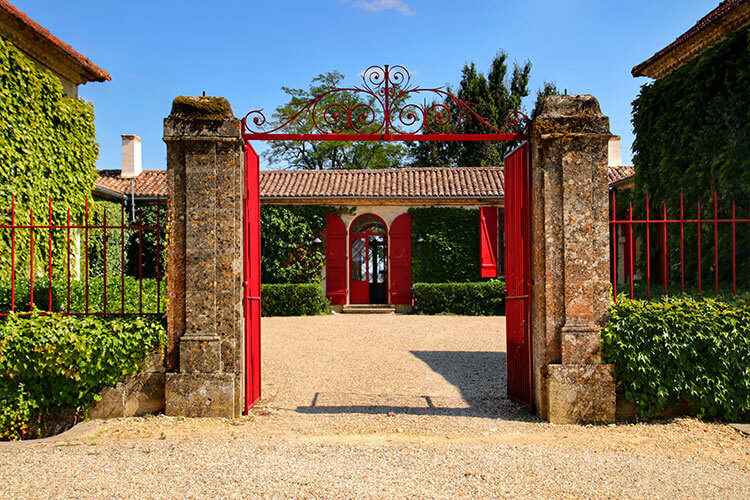 He began leasing the 14 hectares to other wineries in 1913 and in 1930 the Ginsetet family (the family would come to own Château Margaux) was granted guardianship of the estate. For a 20-year period, the estate was even renamed to Château Rabaud. The Sigalas family reclaimed their ownership in 1951 with the current owner and winemaker, Laure de Lambert Compeyrot’s grandmother. Marie-Antoinette de Sigalas was at the helm, and with her husband, rebuilt the winery and the cellar. Laure’s father, Gérard, the Marquis de Lambert des Granges, took over for her grandmother in 1984 and further innovated the winery through a business partnership he set up with another Premier Cru Classé, Château Lafaurie-Peyraguey. Laure, the sixth generation of the Sigalas family, took the helm in 2006. As she told us over the gourmet picnic we shared with her, she was a bit like Pierre and not always so sure she wanted to work in wine. But in leaving Bordeaux to find herself, she eventually found she felt called back to the vineyard. Laure studied at the School of Oenology of Bordeaux and manages the vineyard with a deep passion today. Sauternes is a complex wine. It’s also a wine that is entirely weather dependent. When certain conditions hit other Bordeaux appellations, various things can be done to help balance or control what happens in the vineyard. But with Sauternes, all the right conditions have to come together and it’s often a waiting game. That’s why the terroir is so important, and the composition as well as how botrytis occurs is explained while starting off in the vineyard among the Semilion grapes. 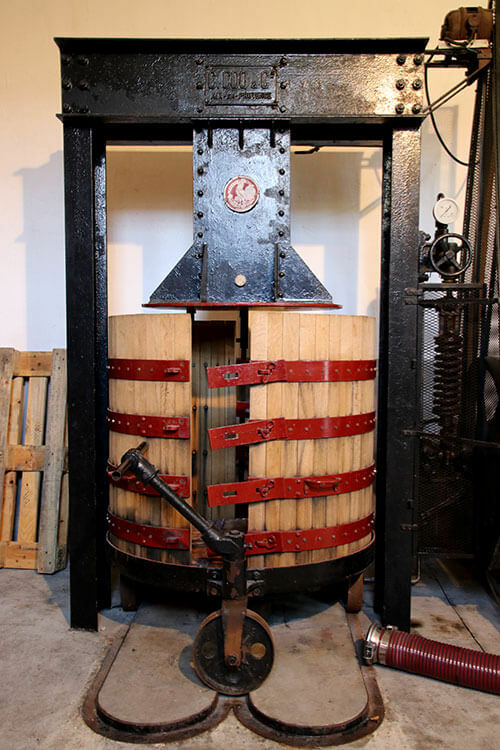 Many of the Sauternes châteaux use their historic presses, and Château Sigalas Rabaud is no different. The presses have to be able to squeeze every drop of juice out of grapes that have basically shriveled up in to raisins and these older presses can apply a mind-boggling amount of pressure. The barrel room is a delight for all of the senses. The wonderful caramels of a Sauternes barrel room dance through the air. And your eyes are immediately drawn to the works of art lining both walls of the long cellar. In 1957 they had the idea to invite students from the Bordeaux Art School to compete in a contest and create artworks inspired by the vineyard. In the end, they couldn’t decide only one of the artworks to be named the best and purchased the entire collection. A glass wall of the tasting room and boutique looks in to the barrel room, which is perfect since the barrel room is really a space you want to linger in. The six generations of the Sigalas family also are represented with portraits in the boutique. 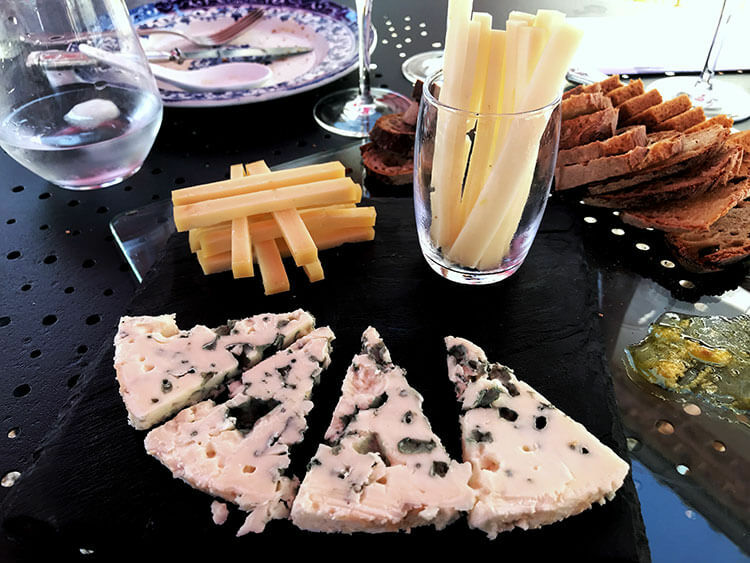 It’s here that the classic visit ends with a tasting and an opportunity to purchase some wines and locals products like foie gras produced by a neighbor. Sauternes is a wine often traditionally paired with desserts, but the freshness and acidity actually make it a very versatile wine that is fun to play with various pairings. Laure loves to cook and test different pairings, and crafted a unique Sauternes tasting experience from that passion for food and wine. The Gourmet Bites tasting can either be set in the salon inside the château or outside on the beautiful terrasse with views of the vineyards and the castle of neighbor Château Lafaurie Peyraguey. The tasting includes five wines of the château, each expertly paired with seasonal dishes presented tapas style. As our gourmet picnic was on a very hot August day, we started with salmon tartare with kiwi, the foie gras mentioned above that is sold in the boutique and made by a neighbor, and rillette (a meat, usually duck here in the southwest of France, that is made in the same preparation style as pâté) with truffle. It was paired with Demoiselle de Sigalas, the dry white wine of the château. It’s a blend of primarily Semilion with Sauvignon Blanc with the percentages depending on the particular vintage, and aged in oak barrels for eight months. Fresh, the wine is perfect for a hot summer day and with fish and seafood. Scallops and shrimp came next, along with Sémillante de Sigalas. It’s a 100% Semilion sweet wine that is aged for 8 months in oak barrels. Paired with the shrimp, scallops and even a bit more of the foie gras and rillette, it’s the perfect example of how wines from the Sauternes appellation can be enjoyed throughout an entire meal. The third wine is 5 Sans Soufre Ajouté, or the 5 Without Sulfur Added. This sweet wine is produced from the same terroir as the Premier Cru Classé, is 100% Semilion and as the name implies – produced without adding any sulfur to the wine. It’s a new wine of the château with the first vintage produced in 2016. It’s paired with roasted chicken and summer vegetables like squash. We also try the Lieutenant de Sigalas, which is a sweet wine made from the same botrytis grapes as the Premier Cru Classé, but the difference is the harvest date. Even just harvesting on slightly different dates produces different notes and Lieutenant de Sigalas has citrus and peach notes that make it really fresh. Neither the Lieutenant de Sigalas or the 5 Sans Soufre Ajouté are too sweet. Both have a freshness and are balanced with a bit of acidity that make them perfect for pairing with main courses of a meal. Of course the best is saved for last, and the Premier Cru Classé is paired first with a cheese course. We’re firm believers that Sauternes and cheese are a match made in heaven, and even blue cheeses like Roquefort that I’ve never been particularly fond of are cheeses I now crave – so long as I can have them with Sauternes. We try Roquefort, Comté and a Basque cheese while sipping the Premier Cru Classé. It’s not that you can’t pair Sauternes with desserts, but pairing Sauternes with a very sweet dessert is doing a disservice to your palette. Laure finds perfect balance between Sauternes Premier Cru Classé and a trio of desserts: macaron ice cream sandwiches in pistachio and raspberry, fresh summer fruits with mint and chocolate fondants. The gourmet picnic really opens your eyes to how Sauternes wines can be paired with so many different dishes. 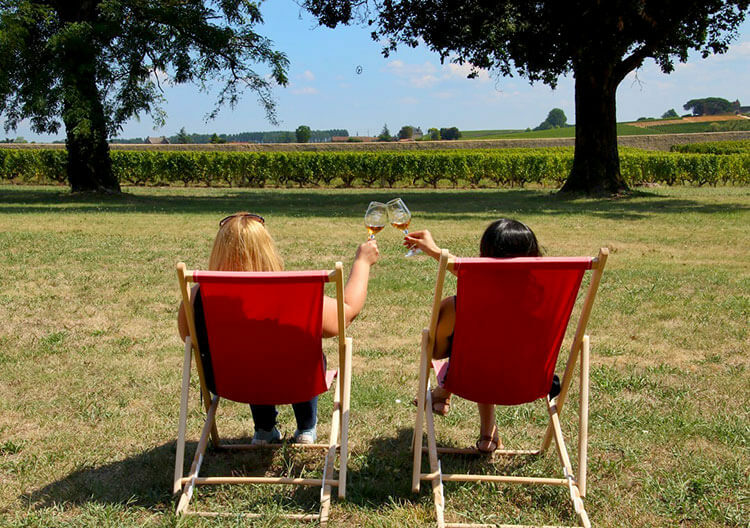 And Laure happily shares a variety of her recipes on the Château Sigalas Rabaud website so that you can re-create your own French picnic with Sauternes back at home. Just don’t forget to pick up a few bottles! Château Sigalas Rabaud is located in Bommes about 45-minutes drive from Bordeaux center. It’s best reached with a car. 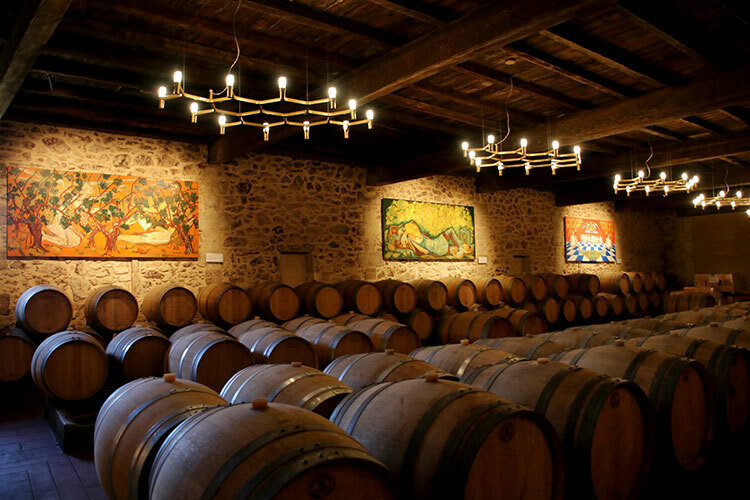 Château Sigalas Rabaud the classic visit and tasting daily from May 1 – September 15 and is open from 10am – 6pm. The rest of the year the château is open from Monday – Friday from 10am – 5pm. Advance reservations are highly recommended, but walk-ins are welcome. Advance reservations can be booked online on Rue des Vignerons. The Terrasse de Sigalas is also open daily from May 1 – September 15 from 11:30am – 7pm. The Terrasse offers wines by the glass and a small menu of local delights perfect for pairing with Sauternes. Reservations aren’t necessary. The Gourmet Bites pairing picnic is available from Monday – Friday at 11:30am. It includes the visit and lasts about 2.5 hours. Reservations are obligatory and must be made no later than 1 day in advance. We were guests of Château Sigalas Rabaud for the Gourmet Bites tasting in order to bring you this story. However, Luxe Adventure Traveler maintains full editorial control of the content published on this site. As always, all thoughts, opinions, and enthusiasm for travel are entirely our own. This article contains affiliate links. When you book on Rue des Vignerons through our affiliate site, we earn a small commission at no additional cost to you. We loved Sauternes but unfortunately we were limited in terms of time there. We certainly intend to go back and you’ve definitely made us want to put Chateau Sigalas Rabaud on the must-visit list! I will admit that I have only recently begun tasting Sauterns. I have a friend who loves them. I had always thought of them as a dessert wine and I love the variety of pairings that they shared with you. Until I can get there myself for a tasting, I might try some of those flavor combinations and those recipes at home! That barrel room is just enchanting! Intriguing look into Sauternes. Dessert wines are almost an afterthought at our house, but as you point out, Sauternes are quite versatile at the table. Nice read!